Earlier this month, some of the Kulp's team received training in the installation of Sika Sarnafil membrane roof systems. 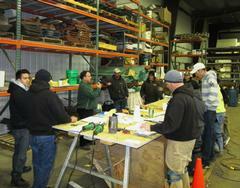 Troy Ribble is Sika's trainer and inspector in this region, and he held two days of hands-on training sessions. Kulp's of Stratford has been installing Sika Sarnafil membrane roof systems for many years, so these sessions served as a refresher for our veteran installers, and as a way to increase the skill level of many of our newer team members. Training done right always pays dividends in increased customer satisfaction, as well as worker satisfaction.